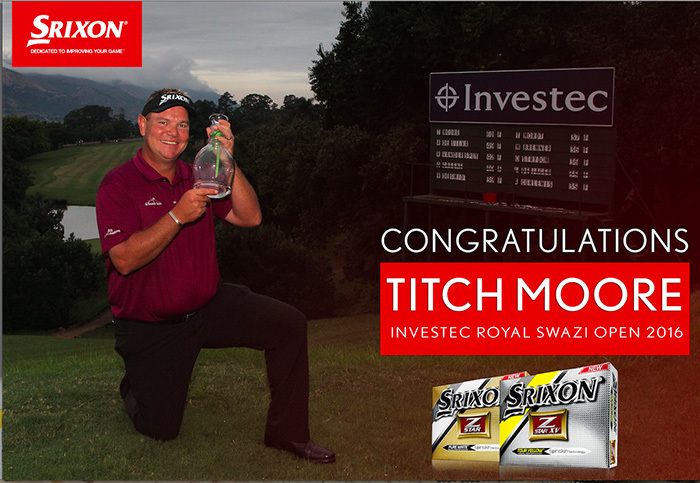 Srixon® and Cleveland® Golf congratulates tour staff player Titch Moore on his victory at the 2016 Investec Royal Swazi Open with a final 18 point eight-under-par 64 round. “I got off to a nice start with a birdie on four and then hit a good shot on five but got really lucky and made eagle. I mean the guys were asking me how many points I had and I didn’t have a clue. I thought I had like 12 or 14 points, and I looked and it was 18. It’s amazing when things go your way how quickly they add up,” he explained. Moore paid tribute to his late mother after adding the 10th Sunshine Tour win to his name by mastering tricky winds in the final round, “I think if I got it to 50 points with those conditions it would have been enough” he added. Moore finished with a massive 60 point total, 11 points over Adilson Da Silva. Moore played with Srixon’s 4th generation Z STAR® XV Tour Yellow ball with SpinSkin® Technology, Srixon Z-545 irons (4-PW), Cleveland Golf 588® RTX® 2.0 wedges (48°, 52°, 58°, 64°). Titch wears a Srixon glove, Srixon cap and carries a Srixon bag. He earned R190 200,00 for his 2016 Investec Royal Swazi Open win, ranking him 48th on the Sunshine Tour order of merit at R218 255,00.